Send this Intricate Designed Meenakari styled Subh Labh Stainless Steel Thali (size 8-9 inches) with Haldiram Kaju Katli gross weight 500 gms. This Meenakari styled Subh Labh Thali will grab your attention in a first glance with its beauty. 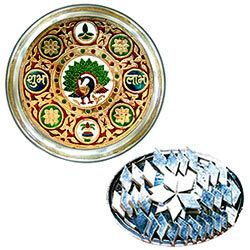 Deliver this Stainless Steel Thali having size of 8-9 inches with Haldiram Kaju Katli weighing 1 kg. Make colorful wishes along with sweet treat from Haldiram.